In the face of growing concern over climate change and greenhouse gas emissions, more and more people, groups and organizations are adopting “green” policies and initiatives. These efforts may also include choosing to invest in companies and other business endeavors that engage in environmentally friendly and/or responsible practices. But how to know who is doing what? The Carbon Disclosure Project (CDP) was initiated with just this concern in mind. The project is helping facilitate the sharing of information about a company’s GHG emissions (most notably, its CO2 emissions) and other climate change practices and policies. This information will help eco-conscious investors — both individual and institutional — to make better informed decisions about where to put their investment dollars. Carbon Disclosure Project offers a growing database of private sector carbon emissions and climate change policies and practices to guide “socially responsible” investing choices. Since its inception in 2000, some 2500 companies from 60 countries have joined in on the Carbon Disclosure Project and begun reporting their estimated carbon emissions and other climate change related policies. This also provides a strong public relations incentive for said companies to set reduction targets and implement improvements such as stronger energy efficiency standards. The non-profit project advocates on behalf of over 500 institutional investors with over 64 trillion under their managament. CDP also works with over 60 corporations or “purchasing agents”, such as Walmart and PepsiCo. Many free-market proponents have argued (and continue to) that imposing government mandates (e.g., carbon caps and taxes) is going about things the wrong way. Market demand and dynamics alone, they argue, should “decide” what and how private businesses should respond to climate change concerns. But of course, in the absence of government mandates, and without some fundamental, profit incentive backing up this philosophy — such as from thousands of eco-conscious investors with lots of money to invest — significant change in corporate polluting and/or energy usage is unlikely to amount to much. Further, these investor efforts at socially responsible investing will have only limited impact if would-be investors don’t have the information they need to decide properly. Thus was born the Carbon Disclosure Project. So,.. What is the Carbon Disclosure Project Doing? The CDP is currently managing five programs: Investor CDP, CDP Public Procurement, CDP Water Disclosure, CDP Supply Chain and New Initiatives. These programs seek both to inform investors as to “investment risk and commercial opportunity” and encourage cooperation on the part of member companies. Through such programs as these, governments, NGO’s, non-profits and pension fund managers all can get a deeper look at the ecologic-economic equation that makes a company’s true bottom line and prospects for future, sustainable growth. The CDP website also publishes corporate responses to their requests for information and, after registering, you can access various of their annual “results” reports, written by CDP partner organizations, and which offer data and analysis (such as indicators of emerging trends or climate change leaders). The reports are meant only to guide would-be investors, allowing them to compare different companies on the basis of, for example, water usage, or, their management of their entire supply chain (and the ecological sustainability of each component in the chain). As more corporations start seeing the necessity and good business sense of greater energy efficiency (which translates into less pollution and enviro degradation), more are joining up with projects like CDP. And even larger corporations — ever on the lookout for a potential buyout of a smaller company — are finding CDP’s data to be an invaluable tool in their own investment and product development decisions. The Carbon Disclosure project encouragements companies to measure and report their energy usage and carbon emissions. The basic financial tenet here is: You can’t manage what you can’t measure… and that includes managing your retirement fund with sustainability as its core, guiding principle. 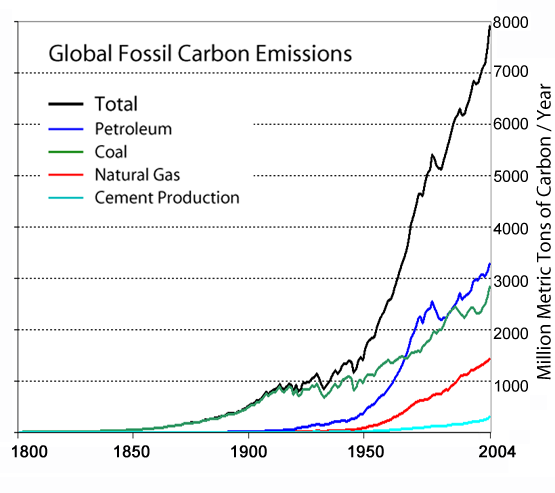 Global Fossil Carbon Emissions Chart: Mak Thorpe, on wikipedia.org under a Creative Commons Attribution-Share Alike 1.0 Generic license.